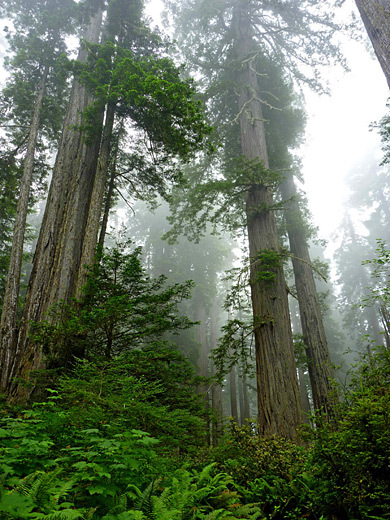 Unlike the three state parks further north along US 101, opportunities for easy viewing of giant trees are rather limited in Redwood National Park, since most are found well away from any road, concentrated in the upper reaches of Redwood Creek. 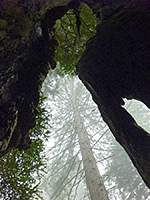 There are only two short paths to redwood groves in the park; Trillium Falls Trail on the west side of US 101 near Elk Meadows, and the Lady Bird Johnson Grove Trail, accessed by driving 2.5 miles up Bald Hills Road, forking off US 101 just north of Orick. This road climbs steeply, all through forest, though most has no large redwoods - they start to appear above about 500 feet, mixed with many smaller trees. 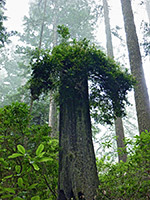 The Lady Bird Johnson Grove loop path winds through a fine collection of old growth redwoods, situated in a flat area near the end of a ridge at elevation 1,200 feet, high enough for the forest often to be covered by low cloud, which adds to the atmospheric scenery. This location is far enough from the main road to be unaffected by traffic noise, though the tranquility is sometimes spoilt by the large number of visitors. The grove is named after the wife of the 36th president, who was one of the dignitaries gathered here for the ceremony marking the creation of the national park, held on 27th August 1969. A plaque records the dedication site, in a small clearing about half way round the loop. 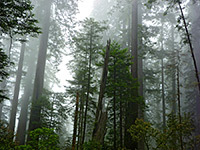 Map of Redwood National Park. Parking for the Lady Bird Johnson Grove is on the south side of the road, from where the wide, well used trail crosses over to the north via a high footbridge, passes a box with brochures ($1 if kept), and soon arrives at the start of the loop section, normally hiked in the clockwise direction. 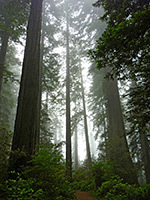 The forest has much lush, varied undergrowth but the redwoods, and Douglas fir trees, are fairly well separated so the grove is quite light and airy, unless enveloped by fog. 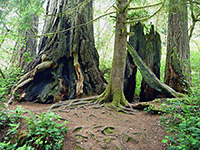 Redwoods in the grove are a typical mixture of new and old, large and small, upright and fallen, burnt, partly burnt but still living, and unburnt. The path stays level as far as the dedication site then descends slightly, meeting the end of the Berry Glen Trail which descends 1,200 feet over 3 miles to Elk Meadows. The LBJ loop turns east across a fern and rhododendron-covered hillside, which falls away very steeply to the north, down to Little Lost Man Creek. The surroundings become a little more overgrown as the path returns to the junction at the beginning of the loop, near the end of an easy walk that takes about half an hour.